Available for All eReaders and Mobile Devices, or Read Online! Also available at iTunes, BarnesandNoble.com, Kobo, and Scribd. Gene Vincent—most famous for his classic 1956 single "Be-Bop-A-Lula"—is one of the most influential rock 'n' roll artists of all time. 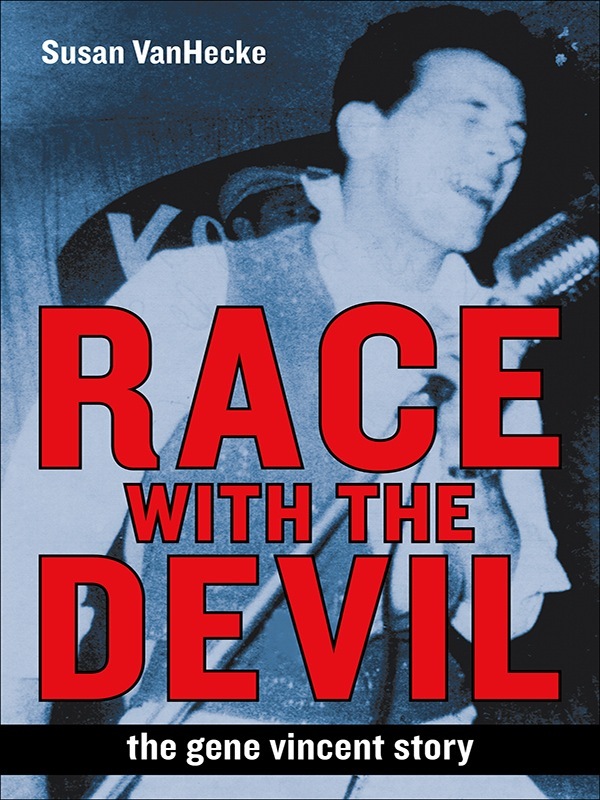 Race with the Devil is the first American biography of this American musical pioneer, who was an idol of generations of rockers after him, from the Beatles to Bowie, Dylan to the Doors. Updated and revised, featuring new information, interviews, and photographs, this 2016 ebook edition of the 2000 original is the most comprehensive survey ever written of Vincent's groundbreaking career and turbulent personal life. Race with the Devil reads like a novel as it explores Vincent's breakneck life of extreme highs and lows. Join Gene as the dirt-poor Virginia boy with the battered leg becomes a bona fide superstar with "Be-Bop-A-Lula," then hits the road with his rowdy backing band the Blue Caps, meets his rockin' best buddy Eddie "Summertime Blues" Cochran, and hangs out in Hollywood to cut records and make movies. Feel Gene's frustration as America turns its back on his earthy, bad-boy stylings, prompting his move to England, where he becomes the Black Leather Rebel, adored by rockers across Europe and beyond. And watch Gene's downward, even violent, spiral after he survives the car wreck that, sadly, Eddie didn't. Race with the Devil digs deep into the personal struggles that darkened Vincent's life at nearly every turn. From the motorcycle accident at age 20 that left the singer with a permanent, painful leg injury (remedied with a metal brace he would wear the rest of his life), to his lifelong struggle with alcoholism—which took its toll in erratic and frequently violent behavior—Gene Vincent's life is startlingly revealed. From the 1960 car crash that killed his dearest friend, fellow rocker Eddie Cochran, and from which he never psychologically recovered, to the constant infighting with friends, family, and band members, to his heartbreaking death at age 36, Race with the Devil is a riveting look at a life of rock 'n' roll triumph, torment, and tragedy. Susan VanHecke is an award-winning author whose books include Three Steps to Heaven: The Eddie Cochran Story, cowritten with Bobby Cochran; Roadwork: Rock & Roll Turned Inside Out, cowritten with Tom Wright, foreword by Pete Townshend; Rock 'n' Roll Soldier, cowritten with Vietnam veteran Dean Ellis Kohler, foreword by Graham Nash; Raggin' Jazzin' Rockin': A History of American Musical Instrument Makers; and the forthcoming children's biography (written as Susan Wood) of musician and stereo sound pioneer Juan Garcia Esquivel, Esquivel! Space-Age Sound Artist. Race with the Devil is available online from Amazon, Barnes & Noble, iTunes, Kobo, Scribd, Smashwords, and other retailers in all ebook-reader formats, for all mobile devices, and also read-online.